The respiratory system is an integrated network of organs and tubes that coordinates the exchange of oxygen and carbon dioxide between an organism and its environment. Harmony is seen in the fact that the respiratory system in animals involves the consumption of oxygen and contribution of carbon dioxide to the environment, while in plants the respiratory system involves the consumption of carbon dioxide and contribution of oxygen to the environment. In humans, air enters the nose or mouth and travels down different tubes to the lungs, where gas exchange takes place. The diaphragm pulls air in and pushes it out. However, there are many different respiratory systems found across various organisms, including amphibians, many of which can breathe through their skin. In mammals, including humans, the respiratory system begins with the nose and mouth; air enters the oral and nasal cavities, which combine to form the pharynx, which becomes the trachea. Air then travels down the various tubes to the lungs. 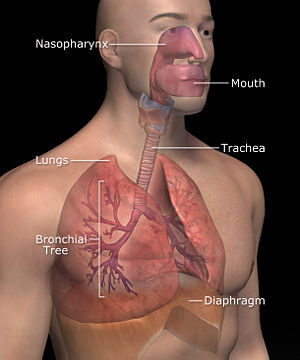 Respiratory muscles mediate the movement of air into and out of the body. The alveolar system of the lungs functions in the passive exchange of molecules of oxygen and carbon dioxide, by diffusion, between the gaseous environment and the blood. Thus, the respiratory system facilitates oxygenation of the blood with a concomitant removal of carbon dioxide and other gaseous metabolic wastes from the circulation. The system also helps to maintain the acid-base balance of the body through the efficient removal of carbon dioxide from the blood. In humans and other mammals, the respiratory system can be conveniently divided into an upper respiratory tract (or "conducting zone") and a lower respiratory tract ("respiratory zone"). The upper respiratory tract begins with the nares (nostrils) of the nose, which open into the nasopharynx (nasal cavity). The primary functions of the nasal passages are to: 1) filter, 2) warm, 3) moisten, and 4) provide resonance in speech. Dust and other air impurities can be very harmful to the body, as can extremely cold or dry air. The nasopharnyx opens into the oropharynx (behind the oral cavity). During inhalation, air entering the oropharynx passes into the laryngopharynx and empties into the larynx (voicebox), which contains the vocal cords. Air then continues past the glottis down into the trachea (wind pipe). The trachea leads down to the chest, where it divides into the right and left "main stem" bronchi. The subdivisions of the bronchus are: Primary, secondary, and tertiary divisions (first, second, and third levels). 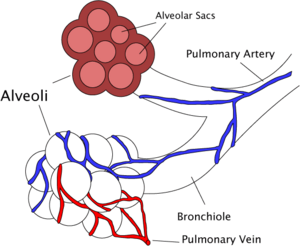 In total, the bronchi divide 16 times into even smaller bronchioles. The bronchioles lead to the respiratory zone of the lungs, which consists of respiratory bronchioles, alveolar ducts, and the alveoli, the multi-lobulated sacs in which most of the gas exchange occurs. Ventilation of the lungs in humans is carried out by the muscles of respiration, which include intercostal muscles. Ventilation is controlled by the autonomic nervous system. The breathing regulatory center is in the medulla oblongata and the pons, parts of the brain stem containing a series of interconnected neurons that coordinate respiratory movements. The sections are the pneumotaxic center, the apneustic center, and the dorsal and ventral respiratory groups (Lane 2010). This section of the brain is especially sensitive during infancy, and the neurons can be destroyed if the infant is dropped or shaken violently. The result can be early death due to "shaken baby syndrome" (SIPH 2006). Inhalation is driven primarily by the diaphragm with help from the intercostal muscles. When the diaphragm contracts, the ribcage expands and the contents of the abdomen are moved downward. The expansion of the ribs results in a greater chest volume, which in turn causes a decrease in intrathoracic pressure, according to Boyle’s Law. When the pressure inside the lungs is lower than the atmospheric pressure outside the body, air moves into the respiratory tract in an attempt to equalize the pressures. At rest, normal respiration is about 10 to 18 breaths per minute, with each inhalation lasting about 2 seconds. Rates of breathing can increase during exercise, fever, or illness. During vigorous inhalation (at rates exceeding 35 breaths per minute), or when approaching respiratory failure, other accessory muscles are recruited for support. During forced inhalation, as when taking a deep breath, the external intercostal muscles and accessory muscles further expand the thoracic cavity and more air moves into the lungs at a greater velocity. Exhalation is generally a passive process, however, active, or "forced," exhalation can be achieved with the help of the abdominal and the internal intercostal muscles. The lungs have a natural elasticity; following the stretch of an inhalation, the lungs recoil and air flows back out until the pressures in the chest and the atmosphere reach equilibrium. The flow of air during exhalation can be compared to that of an inflated but released balloon recoiling to force air out. At the end of both inhalation and exhalation, the pressure in the lungs equals that of the atmosphere. During forced exhalation, as when blowing out a candle, the abdominal muscles and internal intercostal muscles generate extra abdominal and thoracic pressure, which forces air out of the lungs with greater volume and with greater velocity. The right side of the human heart pumps blood from the right ventricle through the pulmonary semilunar valve and into the pulmonary trunk. The trunk branches into right and left pulmonary arteries, which branch into many pulmonary blood vessels. Once the gas exchange process is complete in the pulmonary capillaries, blood is returned to the left side of the heart through four pulmonary veins, two from each side. Due to the short distance within the lungs, the pulmonary circulation has a much lower resistance compared to the systemic circulation, and for this reason, all the pressures within the pulmonary blood vessels are normally lower than the pressures of the systemic circulation loop. Virtually all of the body's blood travels through the lungs every minute. The lungs add and remove many chemical messengers from the blood as it flows through the pulmonary capillary bed. The many fine capillaries also trap blood clots that may have formed in systemic veins. The major function of the respiratory system is gas exchange. As gas exchange occurs in humans, the acid-base balance of the body is maintained as a component of homeostasis. In the absence of proper ventilation, two conditions could occur: 1) respiratory acidosis, a life threatening condition caused by a deficiency of ventilation, or 2) respiratory alkalosis, caused by an excess of ventilation, or hyperventilation. The actual gas exchange occurs at the alveoli, the basic functional component of the lungs. The alveolar walls are extremely thin (approx. 0.2 micrometers), and are permeable to gases. Pulmonary capillaries line the alveoli; the walls of these capillaries are also thin enough to permit gas exchange. Because there is more oxygen in the alveolar air compared to the blood in the pulmonary capillaries, oxygen diffuses from air to blood. By the same mechanism, carbon dioxide diffuses in the opposite direction, from capillary blood to alveolar air. After diffusion occurs, the pulmonary blood is oxygen-rich, and the lungs are full of carbon dioxide. Exhalation follows to rid the body of the toxic carbon dioxide, completing the cycle of respiration. In an average resting adult, the lungs take in about 250mL of oxygen and excrete about 200mL of carbon dioxide every minute. During an average breath, an adult will exchange from 500 to 700mL of air. This average breath capacity is called the tidal volume. The respiratory system lies dormant in the human fetus during pregnancy. At birth, the respiratory system is drained of fluid and cleaned to assure proper functioning of the system. If an infant is born prematurely, the newborn may experience respiratory failure due to under-developed lungs. The incomplete development of the alveoli type II cells results in a deficiency of surfactant, a crucial agent involved in decreasing tension during gas exchange (Widmaier 2005). In the absence of sufficient surfactant, the alveoli will collapse due to surface tension of water remaining in the lungs. This condition is often referred to as "respiratory distress syndrome" of the newborn; it may be avoided if the mother is given a series of steroid shots in the final week prior to delivery. The steroids accelerate the development of the type II alvelolar cells (Sullivan 2001). The movement of gas through the larynx, pharynx, and mouth allows humans to speak, or phonate. Because of this, gas movement is extremely vital for communication purposes, including speaking, singing, or whistling. Infectious, environmental and other diseases (e.g., pneumonia, tuberculosis, asbestosis, particulate pollutants) It is in this category that coughing is of major importance, as it is the body's main method to remove dust, mucus, saliva, and other debris from the lungs. Inability to cough can lead to infection and inflammation. Deep breathing exercises may help keep finer structures of the lungs clear from particulate matter, and so forth. Due to its extensive surface area, the respiratory tract is constantly exposed to microbes , which explains why the respiratory system includes many mechanisms to defend itself and prevent pathogens from entering the body. Plants inhale carbon dioxide gas for use in their bodily functions, including photosynthesis, and exhale oxygen gas as waste, quite opposite of animals, which inhale oxygen and exhale carbon dioxide. Plant respiration is limited by the process of diffusion. Plants take in carbon dioxide through holes on the undersides of their leaves known as stoma. Most plants need little air (Perkins 2003). Different plants, though, may require varying amounts of air and carbon dioxide to function. Generally, there are relatively few living cells outside of plant surfaces because air, which is required for metabolic activity, only shallowly penetrates. Most plants are not involved in highly aerobic activities, and thus have no need for these living cells. Lane Community College. 2010. Regulation of Breathing. media.lanecc.edu. Retrieved July 25, 2016. Perkins, M. 2003. Respiration Power Point Presentation. Biology 182 Course Handout. Orange Coast College: Costa Mesa, CA. Saskatchewan Institute on Prevention of Handicaps (SIPH). 2006. Shaken baby syndrome fact sheet. USASK.CA. Retrieved July 11, 2007. Sullivan, L. C., and S. Orgeig. 2001. Dexamethasone and epinephrine stimulate surfactant secretion in type II cells of embryonic chickens. Am J Physiol Regulatory Integrative Comp Physiol. 281: 770-777. All links retrieved July 12, 2016. Study Guide for the Systems of the Body. This page was last modified on 25 July 2016, at 19:27.